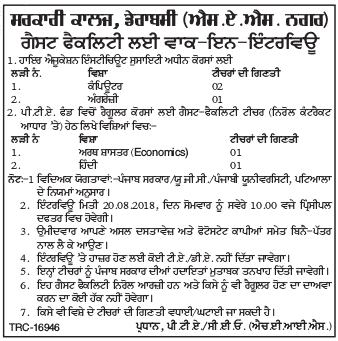 Government College (GC), Dera Bassi (SAS Nagar, Mohali) has given a notification for the recruitment of 05 Guest Faculty (Teachers) Vacancies on the contract basis. The interested candidates can attend walk-in-interview for Govt. College Dera Bassi Recruitment 2018 on 20.08.2018. Dera Bassi Govt. College Vacancy 2018 – 19 notification is out. As per the Notification, there are 05 Guest Faculty (Teachers) Vacancies. The educational qualification for Guest Faculty Teacher Job is as per UGC norms. The maximum age limit is as per GC Derabassi rules. If you are looking for Teaching Jobs in Dera Bassi then this article is only for you. For the courses in Higher Education Institute Society. For the regular courses under P.T.A fund. Date of Interview: 20 August 2018. Educational Qualification: The qualification for Guest Faculty Vacancy is as per UGC/Punjab Govt./Punjabi University Patiala rules. Age Limit: As per Govt. college Dera Bassi rules. Salary: As per the Punjab Govt. norms. Job Location: Dera Bassi, Punjab. How to Apply: You can attend walk-in-interview in the Office of Principal, Govt. College, Dera Bassi on 20.08.2018 at 10.00 AM. Kindly bring your original documents and the photocopies of the same.